Residenza Giardino offers different types of apartments, all with sea views, air conditioning and a furnished balcony. There are many common services, such as: outdoor parking and garage, WI-FI, bar-restaurant, swimming pool, solarium. Small and medium-sized pets are allowed. 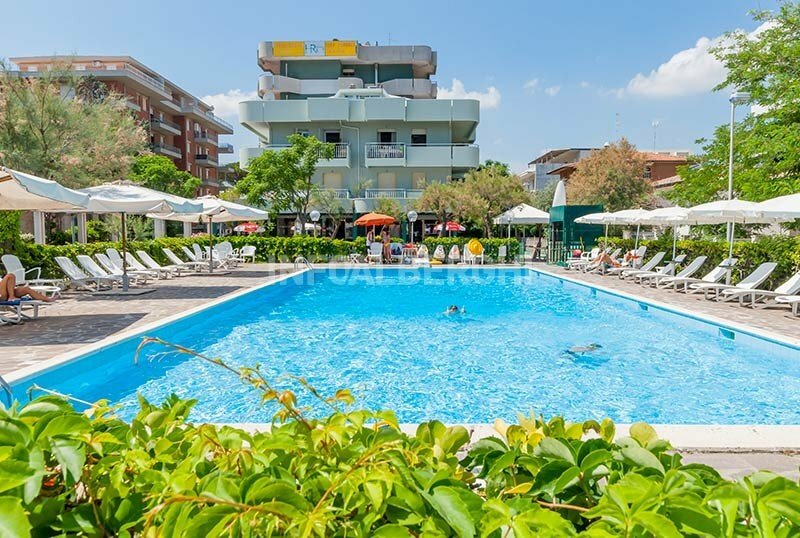 The Residenza Giardino is located directly on the beach of Bellaria, in a central position. All apartments have a pleasant sea view, air conditioning, satellite TV, WI-FI, safe and equipped balconies. THREE-ROOM-TYPE A: three-room apartment for 6 people composed of 2 double bedrooms (one with a single bed flanked), living-dining room with sofa bed, kitchenette, 1 bathroom with shower box, air conditioning (with extra charge), furnished balcony. TYPE A SUPERIOR: three-room apartment for 6 people composed of 2 double bedrooms with single bed side by side, living-dining room with sofa bed, kitchenette, 2 bathrooms with shower box, air conditioning (with supplement), balcony with sea view. TYPE B: Two-room apartment for 4/5 persons composed of a double room plus a single bed, a living-dining room with a sofa bed, a kitchenette, a bathroom with shower box, air conditioning (with supplement), a furnished balcony. TYPE C SUITE: attic apartment (2/3 pax) with double bed and single sofa bed, bathroom with shower box, kitchenette with microwave oven. The sea view here is particularly beautiful (no TV sat, WI-FI, safe). The Residence Giardino has a large swimming pool with equipped solarium area, entertainment and two lifeguards, free use of bicycles, Café restaurant, 24 hour reception, reading room, newspapers in consultation, two lifts. For a fee: laundry service. PARKING: uncovered, available for all to 900 m from the structure. For a fee and with limited places: garage and carport. PETS: medium-sized pets allowed (paid cleaning). BREAKFAST: classic or international at the Ristorantino Giardino, located in front of the swimming pool. LUNCH AND DINNER: the restaurant offers a menu (à la carte) of the Romagna and maritime tradition. Homemade desserts with the possibility of take-out. In the hotel: outdoor playground area, swimming pool with shallow water, strollers, entertainment, baby / mini / junior club. For a fee and on request: baby sitter service and pediatric counseling. In the room: cot (for a fee) and baby kit (on request). At the restaurant: high chairs, baby food, dedicated menus. The residence has a large rectangular pool located right in front of the beach and surrounded by a solarium area. It is constantly guarded by life guards and hosts games, moments of relaxation and entertainment. The hotel has a private beach, the Bagno Giardino n. 13, which can be accessed directly from the hotel's garden, with no roads to cross. All children up to 3 years, in all periods, are free! Animation with miniclub and every evening Babydance From this year there is also a multipurpose room dedicated to children! In our residence for all stays in apartments, with full board or half board. 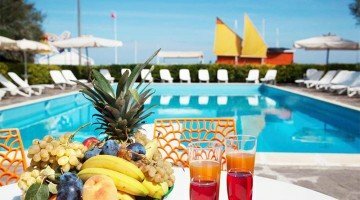 All-inclusive packages, consumption, all taxes, beach umbrella + 2 free beds at the sea, sheets, parking, wifi in the apartment, free use of swimming pool and bicycles. Monoloale type C Suite 3 pax € 280 per week in all-inclusive package! Two-room flat 4 beds € 320 per week all included! Three-room apartment 6 beds € 460 per week all included! SPECIAL OFFER JUNE: 10 DAYS AT THE PRICE OF 1 WEEK !!! UNTIL 22 JUNE BOOK 10 DAYS OF HOLIDAY AND PAY FOR YOU USING ONE WEEK !!! SPECIAL OFFER JUNE: 10 DAYS AT THE PRICE OF 1 WEEK !!! UNTIL 22 JUNE BOOK 10 DAYS OF HOLIDAY AND PAY FOR YOU USING ONE WEEK !!! APARTMENTS DIRECTLY ON THE BEACH WITH POOL, ENTERTAINMENT, MINI CLUB, BEACH WIFI, TV SAT, PARKING.